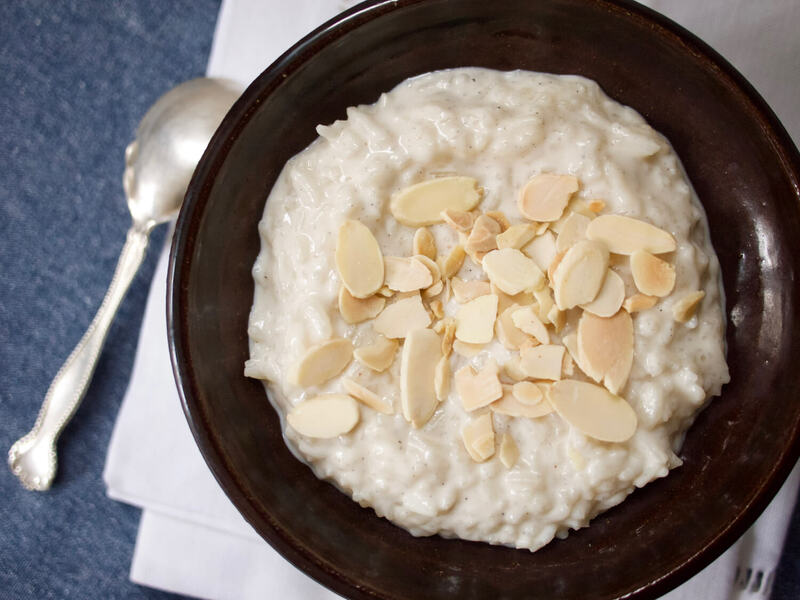 There's something luxurious about the fragance and flavor of almond - a nutty, fruity creaminess that can instantly make any dessert feel special, even rice pudding, which you might not think of as particularly fancy. But, if treated like a fancy dessert, rice pudding can become one! In this recipe, fragrant jasmine rice is cooked risotto-style in almond milk, yielding perfectly tender grains of rice in a creamy sauce that still manages to be fairly light. The addition of Vanns Ground Cardamom, Almond Extract, and Vanilla creates a combination of flavors that is both elevated and comforting without being overpowering. And a sprinkle of toasted sliced almonds across the top of each dish creates the perfect textural crunch. Serve this dessert hot or chilled - each temperature yields a slightly different version of the dish, both quite delicious. Place rice in a medium saucepan and cook over medium-low heat, stirring occasionally, until rice is slightly toasted and has a nutty aroma, about 5 minutes. Add ground cardamom and 1 cup of almond milk to rice and increase the heat to medium. Stirring occasionally, cook until most of the milk has been absorbed, about 4 minutes. Add 1 more cup almond milk and cook until most of the milk has been absorbed, stirring occasionally. Add remaining cup of almond milk and cook until rice kernels are visible and most of the milk has been absorbed again, about 7 minutes. Add sugar and salt and stir to combine. Cook until liquid is almost fully absorbed by rice, about 3 more minutes. Remove the pan from the heat and stir in almond and vanilla extracts. Serve warm, topped with sliced almonds, or refrigerate in an airtight container for up to 2 days. Refrigerated rice pudding can be served cold or reheated gently in a pan with additional almond milk if desired. If you’ve never had horchata, you’re missing out on an icy cold drink that is somehow both creamy and refreshing. Essentially, it’s a sweetened, flavored almond-rice milk.